This past weekend, Realmz Escape Game brought along their Ancient Egyptian modular escape room along to Supernova – a pop culture event in Australia. The traditional lock and key mechanism often found in escape rooms? Nowhere to be found here and that’s really, really exciting. Instead they used computer controlled locks along with automatic doors to separate each puzzle room. Pairs of people were given the opportunity to enter the escape game and only given three and a half minutes (or 210 seconds) to solve each puzzle in a room. While participants only get a short amount of time, they walk away with a understanding of what an escape room can contain. Thanks to Glenn for the information and we’ll be keeping an eye out for when they establish a physical escape room facility in the future. The first escape room that’s attempting to open in Canberra – Riddle Room – are currently running a Kickstarter campaign to raise $30,000 to start the first escape room in the nation’s capital. There’s only four days to go with only around $5,500 raised at the moment. Regardless of the outcome of their Kickstarter, hopefully they’ll continuing following on with their idea to launch an escape room. Best of luck guys! While Escape Hunt has already mentioned they are looking towards setting up a room escape in Adelaide for some time, AdventureRooms has already swooped in. They’ve set up AdventureRooms Adelaide and brought along the well-known franchise to Australia for the first time. It’s a smart move, as there are no operating competitors, that are known of and helps them to establish a base for future expansion in Australia. I spent the last weekend at Sydney Supernova, a pop culture event with lots of cosplayers, comic books and celebrity guest panels. 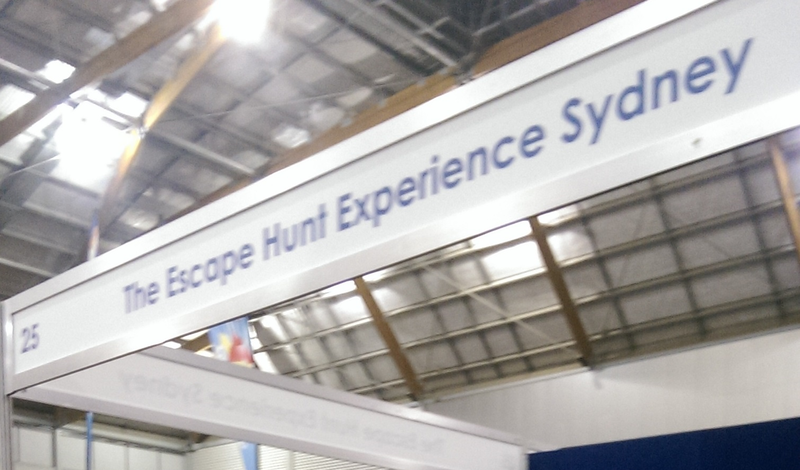 There was also an Escape Hunt Sydney booth which I checked out – they had wooden puzzles and t-shirt merchandise on sale. Within the booth they also had a 15 minute setup where anyone could try to solve the puzzles and unlock a drawer with three draws (the bottom two were locked, the first unlocked). I was telling my friend about the booth and how we should go try it out, while they hadn’t tried out a room escape game before they knew what a room escape was. When we got there, the staff showed us the instruction sheet, the drawer and gave us a timer to start when ready. There was a couple of minutes still on the clock after we solved all the puzzles and I managed to take a blurred photo of the booth name along with the brochure they handed out. Next weekend on the other side of the country at Perth Supernova, Realmz Escape Game have decided to bring along an entire escape room for all attendees to try out. 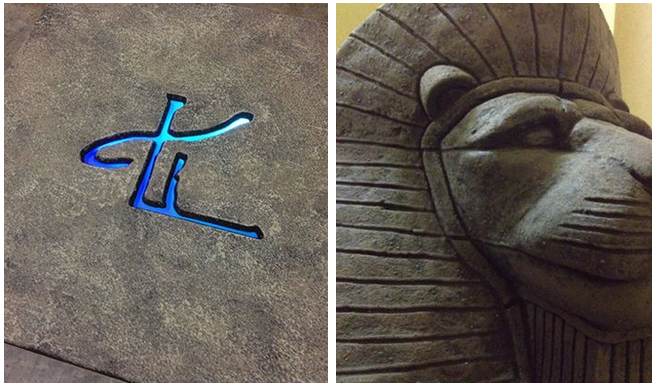 It’s based at the Perth Convention & Exhibition Centre from June 27th to 28th and has an Ancient Egypt theme. There’s not much other information about the theme but there’s some images appearing on their Facebook such as a glowing symbol on what looks like a trigger stone. 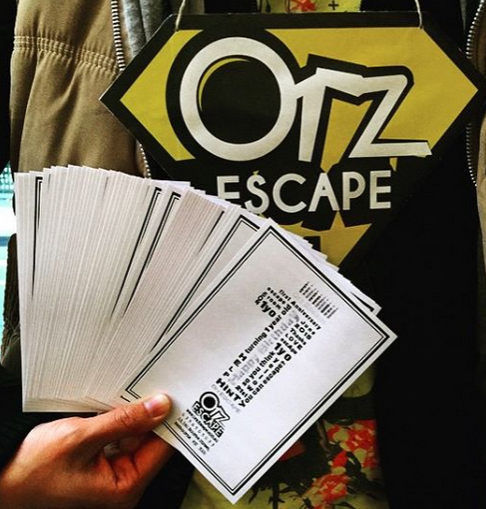 This also caught our attention recently- Orz Escape have a unique word puzzle that’s been printed on their flyers and brochures (there’s suppose to be a hidden discount inside the word puzzle) – can you solve it? There’s more photos of the puzzle on their Facebook page if you wanted to see it better.